Jack’s is best known for its authentic sliders, plus serves delectable sushi and American delicacies under the same roof. We believe in giving our guests the best of cuisines of both worlds. Our dining area is decorated with elegant lights and simple furniture which gives the perfect home-style dine-in ambiance. We have expanded our catering services, wherein we have catered for nearly 10,000 events. 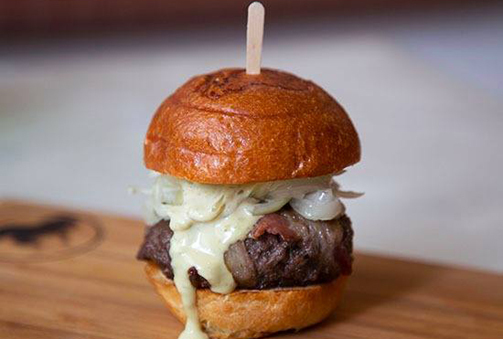 Our signature favorite is ‘Jack Sliders’ – bacon wrapped beef burger with onion jalapeno mayo. We believe in customer satisfaction where we focus on quality food. While it might not be a combination that comes to mind, at Jack’s, you’ll find Asian-inspired sliders along with sushi served in an intimate setting. Sliders are made with things like pork belly, crispy tofu and kimchi. The “Jack’s Slider” is a bacon-wrapped beef burger with grilled onion and jalapeno mayo served with Old Bay fries. Specialty sushi rolls include curry crab, jalapeno tuna, and the Red Dragon made with spicy tuna, avocado, cucumber, crunch, BBQ sauce and tobiko. Ramen dishes are also offered, along with a selection of beer, wine and sake. This is what we do here. South Grand St. to North 60th St. & FDR to West 9th Ave.